Designix Web Solutions Provides Portland SEO to small and medium size businesses in the Portland Metro Area. Ready To Grow Your Business? Contact Us! SEO stands for Search engine optimization. It is the process of driving traffic from the organic search results to your website. Getting your website on the first page for the keywords relevant to your business can be a difficult task but with the right Portland SEO Company strategy, you can almost guarantee first page placement.This is where Designix comes in. Designix focuses on local strategy and content marketing. This means we pump fresh content relevant to your business not only in to your website but also into other media outlets and editorials to build quality links throughout the web, grow exposure and ultimately gain top placement in the search results for your targeted keywords. When looking for a Portland SEO Company keep Designix in mind. 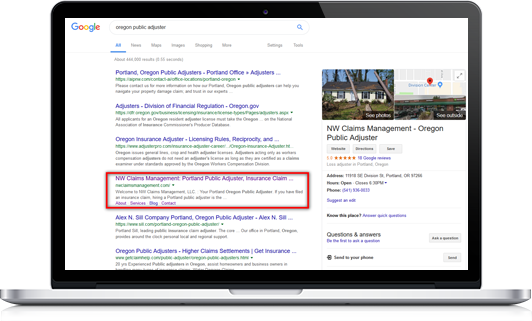 With a proven track record as a Portland SEO Company, guaranteed results, and no contract, its a no brainer why our customers chose us as their Portland SEO Company. Get your message in front of the right eyes with cost-effective SEO services from Designix Web Solutions in Portland, OR. Save yourself the hassle of hiring extra staff or the risk of attempting do-it-yourself SEO and let us put together a plan based on your goals and available budget. We go beyond basic SEO to provide an assortment of services designed to help you succeed online. Save time and money by gaining access all of the SEO services you need from one convenient source. At DWS, we make it our business to stay on top of trends and technology to better serve our clients. If you’re like most businesses, you have multiple online engagement needs that must be met. Fortunately, we have the resources necessary to efficiently and effectively provide an assortment of services at rates sure to fit into any budget. Help your customers find you easily with strategically prepared local content. Our dedicated team will collaborate with you to develop local Portland SEO strategies and campaigns to extend your online visibility. Optimize your content for all of the possible ways customers have to find you online. We provide digital marketing services specific to websites, blogs, social media platforms, and mobile devices. A big part of what we do is dive into analytics to monitor and track stats that matter most to your business. Connect with your audience in a way that’s effective thanks to our real-time social media analytics. We’ll help you manage your social media responsibilities by looking at results you are currently getting from your preferred platforms on a bi-weekly basis. We’ll also recommend platforms where you may want to focus more of your attention and resources. Get more out of your content with our comprehensive analysis of your website. We’ll track your existing online traffic patterns, evaluate the overall quality of your site’s design, and determine what’s working for you and where there’s room for improvement. It’s an important step likely to boost your ROI and increase your online visibility. See immediate results with well-crafted paid advertising campaigns. We’ll research keywords and terms to recommend how to best launch a campaign while producing relevant content likely to lead to clicks, viable leads, and conversions. Make it easier for new customers to find your business by letting us optimize your Google Maps listings. When used correctly, Google’s GPS data can be an important and rewarding part of your digital strategy. Achieving a high placement in local business listings becomes even more of valuable asset when you consider how it can impact your overall search engine ranking. We’ll add credibility to your website by presenting your content in a way that attracts quality links from reliable sources. Trusted links further boost your online visibility by attracting key influencers, increasing your brand’s authority, and generating more referral traffic. All roads point back to your website when it comes to your online marketing efforts. Our customized website design services are just as unique and personalized as your business and brand. From the images and videos included to the headlines used and menu setup presented, we’ll evaluate all elements of your website. Improve your rankings with a comprehensive analysis of your website. Our team will check factors that often affect traffic patterns and the behavior of visitors to your site, including page load times, your selection of keywords, and the relevance of your content. Benefit from one of the most effective forms of online engagement with email campaigns tailored to the needs of your recipients. We offer custom email templates you can further personalize for specific campaigns. At Designix Web Solutions, we want to see you succeed with your online engagement efforts. Our dedicated team in Portland, is committed to providing personalized results based on proven expertise. Contact us today to get started with a free SEO consultation.